Eat Your City: 10 minute lunch or dinner: Spaghetti Vongole or pasta with clams and white wine broth - super simple and easy! Posted by I sometimes make this as a super quick weekend lunch when there's lots of errands to run, or for a fast dinner after a long day of work and I just want something fast, tasty but still healthy and then crawl into bed. You can make this with any pasta, but I like using Spaghettini or angel hair pasta as its much thinner than Spaghetti, so it cooks faster and absorbs the white wine broth really well. 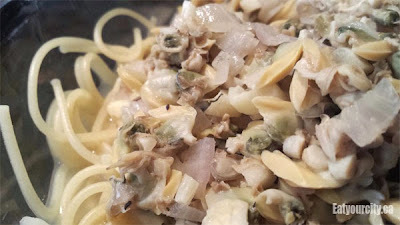 You can take an extra 10 min to clean and cook fresh clams, but on a work night, I make this with a nice big tin or 2 small tins of canned whole clams.This simple dish seriously can be made in 10 minutes, as long as you prep the veggies and open the cans of clams after you start cooking the pasta. 1) Bring a pot of salted water to boil and prepare the pasta according to directions, drain and set aside when pasta hits al-dente (when you bite into it, its firm and is cooked through). 3) In a large pan on medium high hear, heat up the oil, butter, garlic and shallots - let them cook for about a minute until fragrant. Add in white wine, then canned clams (with the broth) and heat through until the broth bubble. If using live clams, cover the pan with a lid and let them steam for 5 min and discard any unopened clams). Season to taste and dump it over your pasta.